Tiimiakatemia | Esseepankki » Who moved my cheese? Kirja: Who moved my cheese? 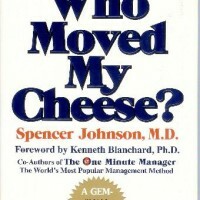 Who moved my cheese is a story about change. I started wondering, why are people so afraid of change? Why am I so afraid of change? There are two kinds of people, those who sees the changes and are willing to adapt, and those who don’t want changes to happen. I used to belong to the group who don’t want changes to happen. You work hard for get and find something what makes you happy, once you got it you want to hold on to it. It makes you feel secure and stable and you’re not looking for anything else. You’re blind for all the signs of change and even if you could see them, you wouldn’t believe them. Why? Because people think that change is bad. Then comes the day when you are forced to see the change. Denial. I wasn’t ready for this, no one warned me. You finally see the problem. This happens a lot in my team, we focus on worrying about the problem, denying it and no one focuses on actually solving it. Solving a problem and finding answers requires the will to change. We should learn to let go and move on. Why do we see changes as a bad thing? Changes can get us towards better things, towards things we couldn’t imagine. Who moved my cheese was an eye-opener for me, it helped me to change my opinion about change, change is good.